When Chinese Premier Li Keqiang spoke the words "Hello, Prime Minister Borissov" in Chinese into a small translating machine, they were immediately translated into Bulgarian for Bulgarian Prime Minister Boyko Borissov. The interaction took place on the morning of July 7, while Li was introducing the artificial intelligent (AI)-powered translating machine developed by a Chinese company to the leaders of 16 Central and Eastern European Countries (CEEC), who were attending an exhibition on the achievements of China-CEEC cooperation in Sofia, Bulgaria. Borissov was so impressed by the small iFLYTEK translator that it prompted Li to present him with one as a gift. The translator can quickly and accurately translate between Chinese and 33 other languages including English, Japanese, Korean, French, Spanish, German and Russian. It can provide auto-translation services in real time, making daily communications during travel, work and medical diagnosis more convenient. Released by iFLYTEK Co. Ltd. on April 20 in Beijing, the translator will no doubt further boost the 19-year-old company's market value, which has increased from 3 million yuan ($449,008) to 80 billion yuan ($11.97 billion) since 1999. 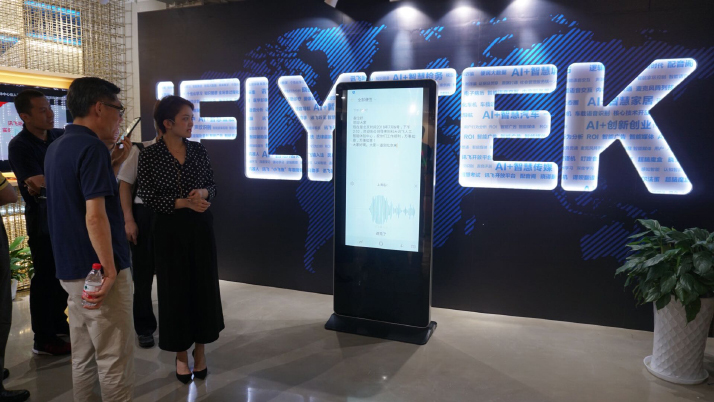 Established in Hefei, capital of east China's Anhui Province, iFLYTEK has become the largest listed intelligent speech and AI company in the Asia-Pacific region and a global leader in speech synthesis, speech recognition and natural-language processing. Before being incorporated as a company, iFLYTEK operated as the Man-Machine Speech Communication Laboratory at the University of Science and Technology in China. Supported by the State Hi-Tech Development Plan, the laboratory enabled synthesized voices to sound clearer and natural through its independently developed system in 1998. "I thought we could develop some products since our technology was already applicable," said Jiang Tao, the Co-founder and Senior Vice President of iFLYTEK. At the end of 1999, iFLYTEK was established, staffed by ex-laboratory personnel and 3 million yuan in registered capital. The company's mission was to make machines and devices such as mobile phones, computers, televisions, cars and toys listen and speak as humans do. The first five years however were a struggle financially as the first product, software enabling people to operate computers with voice, didn't take off as hoped. The turning point came at the China Hi-Tech Fair held in Shenzhen, south China's Guangdong Province, in 2000, when the intelligent speech technology presented by iFLYTEK attracted the attention of Huawei, a leading global information and communications technology solutions provider. Huawei made a bulk purchase of iFLYTEK's technology and integrated it into Huawei's products. Jiang said this was the company's breakthrough moment and iFLYTEK was able to settle its outstanding debts and reached the break-even point in 2004. The following year the company developed a ringtone system which enabled people to call in and find music of their choice to download as ringtones for their mobile phones. The system, which used a database of thousands of songs, proved so popular with Chinese consumers that it was quickly adopted by China Mobile, China Unicom and China Telecom, the three major mobile service operators in China. During that time, the speech services related to music and ringtones were almost all provided by iFLYTEK. The company went on to see a 130 percent increase in its net profit for three consecutive years from these businesses. In 2007, the annual revenue exceeded 200 million yuan ($29.94 million). This allowed the breathing space to focus on its R&D and led to a listing on the Shenzhen Stock Exchange in 2008. In recent years, iFLYTEK has made several achievements in intelligent speech and has become a leader in the industry. The company ranked first in all indicators in the fourth CHiME Speech Separation and Recognition Challenge in 2016, the most influential speech recognition contest in the world. In 2017, the precision of iFLYTEK's online speech recognition platform reached 98 percent. Continuous breakthroughs have also been made in its dialect recognition function that now covers 22 dialects. In 2013, iFLYTEK initiated the SuperBrain Plan, intending to advance the abilities of machines from listening and speaking to thinking and learning. According to the plan, machines can be programmed to learn rule-based and logical thinking relating to human brainwork and solve practical problems. "They can help humans in all aspects," said Jiang. This plan was applied to the medical sector, and in November 2017, the AI doctor assistant became the first of its kind to pass a national physician certification examination in the world. Doctors at Anhui Provincial Intelligent Hospital were shown how the AI doctor assistant can help them with diagnosis and provide treatment information for their patients. Doctors can make a final conclusion based on the system's suggestions and their own diagnosis, remarkably speeding up the process. According to Jiang, "iFLYTEK's AI doctor assistant has been able to help physicians with diagnosis at community-level hospitals. This can solve the challenges of uneven distribution of medical resources in China. After all, doctors in top hospitals are still in short supply." In the field of education technology, iFLYTEK's achievements are also impressive. Currently, the machines developed by the company have reached an expert level in terms of checking homework and test papers. "Machine-based homework checking not only saves teachers' time, but also enables teachers to collect students' learning data in the process and tailor teaching to students' individual aptitude, as Confucius suggested more than 2,000 years ago," said Jiang. In schools using this technology, every student does different homework applicable to them, which improves their learning efficiency. Student's average time spent on homework per day was reduced by 1.5 hours, according to Jiang. At present, iFLYTEK's intelligent education products have been widely applied in all provincial-level regions on the Chinese mainland as well as overseas markets including Singapore. The company has cooperated with more than 13,000 schools and served over 80 million teaching staff and students. Furthermore, work in the courts of justice is being assisted by iFLYTEK's technology as an AI trial system which can analyze reams of files in minutes and assist judges by providing them with three suggestions: What charges should be made, the length of prison term for defendants, and how much they should be fined. The AI trial system launched by iFLYTEK has been applied in more than 400 courts and more than 1,000 tribunals throughout China. It has saved time in court trials by 30 percent on average, and enabled trial records to be 100 percent complete, remarkably improving the quality and efficiency of judges' work. "The Third Industrial Revolution that took place in the past decades mainly solved the problem of mutual connection, such as people-to-people connection, commodity-to-people connection as well as information-to-people connection. However, it did not solve the problem of information processing after the connection. 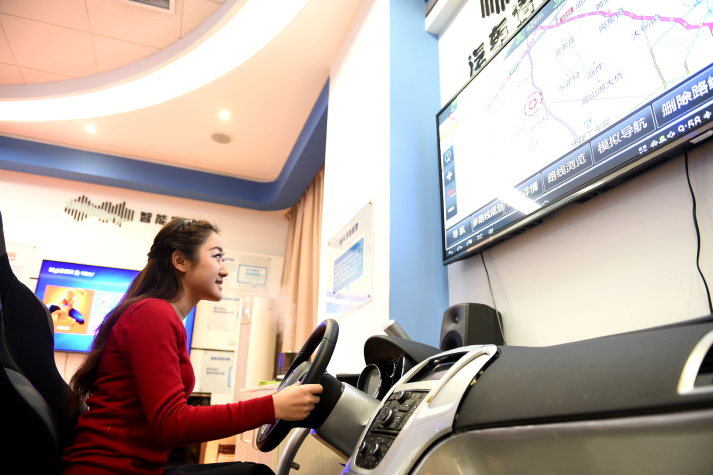 In decades to come, through AI technology, people can significantly reduce the costs of information processing after the connection and improve the productivity of the human brain," said Jiang.